Salisbury Plain, Wiltshire, England, 2950 B.C. Around 3000 B.C. (middle Neolithic) the semi nomadic peoples that populated the Salisbury Plain began to build Stonehenge as the center of a ceremonial site. We know almost nothing about who built it. A popular theory attributed it to the Druids but modern dating shows it to be at least a 1000 years before the Druids came to power. Stonehenge was built as an astronomical calendar aligned with lunar and solar events such as the summer solstice where the sun rises directly over the Heel Stone and the first rays shine into the center of the monument between the open arms of the horseshoe arrangements. Built in three phases between 2950 B.C. 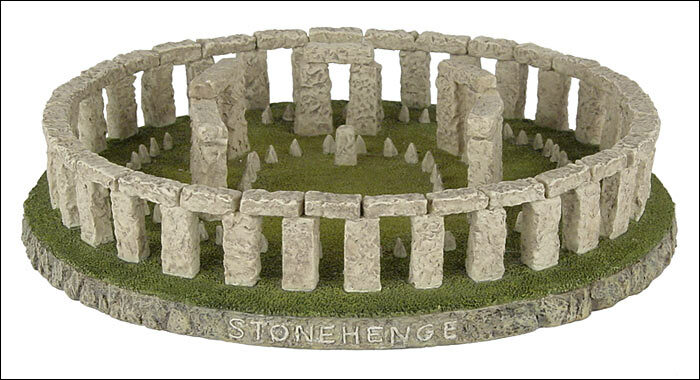 and 1600 B.C., the original construction was a circular ditch and mound with 56 holes forming a ring. The first stone placed at the site was the Heel stone erected outside of the entrance to the site. 200 years later 80 blocks of bluestone were erected forming two concentric circles. At some point this construction was dismantled and the final phase of the site begun. The bluestones were moved within the circle and the gigantic stones and lintels that give Stonehenge its distinctive look were installed. Some of these stones weigh 26 tons. It remains a mystery how such huge stones were moved from the quarry by a supposedly primitive people.